The next meeting of the DASE Delegation in presence of the 10 ASEAN Ambassadors is foreseen for 25th February 2019, room ASP 3G2, from 16:00 to 18:00. Chairs Werner Langen (ASEAN) and David McAllister (AFET) after the exchange of views in AFET meeting of 21 January 2019 with the Minister of Foreign Affairs of Malaysia, Saifuddin Abdullah. During the meeting, Members were informed about the 10th Asia-Europe Parliamentary (ASEP10) Meeting in Brussels at the end of September. The Chair furthermore debriefed the Members on the recent participation of an EP delegation in the 39th ASEAN Interparliamentary (AIPA) General Assembly, which took place between 3 and 5 September in Singapore. Representatives from the European External Action Service spoke about the latest developments in the Philippines, Thailand and EU-ASEAN relations. Members who participated in the recent Delegation visit to Indonesia and Malaysia reported on the meetings held there as well as on political and economic developments. The meeting was dedicated to preparations for the Delegation visit to Indonesia and Malaysia from 7 until 11 May 2018. There was an exchange of views with representatives from the EEAS and the European Commission on the current political and economic situation in both countries as well as presentations by the Ambassadors of Indonesia and Malaysia. Exchange of views with the Ambassadors of the ASEAN countries in the presence of representatives from the European External Action Service and the European Commission's DG Trade. The state of play of EU-ASEAN relations was presented by the EEAS. MEPs discussed current political and economic developments in the Southeast Asia region with the Ambassadors of the 10 ASEAN Member States. The Delegation discussed the human rights situation in the region, notably against the background of a resolution on Myanmar and two urgency resolutions on Cambodia and Vietnam. The Ambassador of Myanmar provided some explanations and an update on the situation from Myanmar's point of view. The meeting was held to prepare the visit of the Delegation to Cambodia and Laos (30 October - 2 November 2017). Speakers from the European Commission and the European External Action Service joined discussions via videoconference. The Ambassador of Laos to the EU, Khamkheuang Bounteum, briefed MEPs on the political and economic situation in his country. The Ambassadors of Cambodia, Laos, Myanmar, Thailand and Singapore as well as Mr David Daly, Head of ASEAN Division in the European External Action Service, participated in the meeting. Points of discussion were the planned delegation visit to Cambodia and Laos and the upcoming 38th General Assembly of the ASEAN Inter-Parliamentary Assembly (AIPA) in September in the Philippines, at which MEP Neena Gill would represent the European Parliament. The Chair reported on the Delegation's visit to Singapore and Myanmar. A presentation was given on the European Parliament's study on 'The future of EU-ASEAN relations'. the Ambassadors of the Member States of the Association of South East Asian Nations (ASEAN). 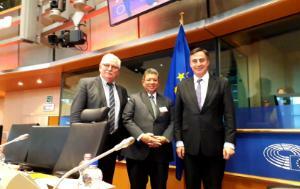 MEP Sargentini, the Lead Member for democracy support for Myanmar. representatives of the EEAS on Myanmar and Singapore also discussed the upcoming visit (via videoconference). MEP Bütikofer (on the forthcoming report on EU-ASEAN relations - tbc). rllegal, Unreported and Unregulated fishing in Southeast Asia. Mrs. Busaya Mathelin, Ambassador and Head of Mission of Thailand to the European Union, attended the meeting and spoke about the political situation in Thailand and EU-Thailand relations. Prof. Niki Aloupi, University of Strasbourg, presented a report on the recent judgement of the Permanent Court of Arbitration on the South China Sea. Exchange of views was held on the forthcoming Delegation visit to Myanmar and Singapore from 31 October - 4 November 2016. David Martin, the INTA Rapporteur for the FTAs with Indonesia, the Philippines and Myanmar. general political developments in Indonesia and the EU.